Skype is the method I prefer for recording with guests. It’s safe and free, and you can download it for Mac or PC. 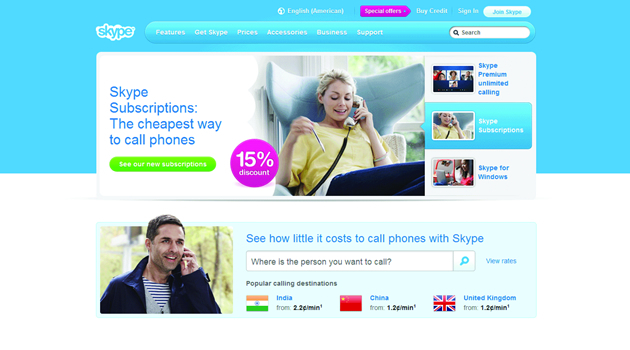 When you go to Skype for the first time, it will probably look like there’s a cost to download it. That’s because Skype is trying to monetize their service, and you can purchase a phone number, voice mail, or a subscription to call phone numbers in addition to computers. Rest assured this is a free download and computer to computer calling is free. Skype works best with a high speed internet connection and a headset microphone like this one on Amazon (this is not an affiliate link, I get no money or other incentive if you buy it). You can buy headset mics just about anywhere at places like Target or Wal-Mart. If you don’t have a headset and don’t plan to purchase one, ask around and see if there’s anyone you know that will loan you theirs. In lieu of a headset, many newer computers (4 or 5 years old) have microphones built in. If your computer has a mic already, all you need is headphones or earbuds, like the kind from your iPod or MP3 player. I have several podcasting gadgets on my end to do the recording and make sure everything sounds good. If you really want to be my guest, but feel like some of these technical details are holding you back, please contact me. I’m fairly tech savvy and will find a way to make it work. The success of this podcast relies on the generosity of Etsy Shop Owners who are willing to share their time with me and my audience. I care deeply about this show, and I have nothing but the best intentions for both of us.